During the dramatic events of WWII the US was facing a major confrontation with Japan. A tough fight for the latter. Pearl Harbor kamikaze attacks alone speak about the futility of Japanese effort. Terrified that US airplanes could easily fly over their cities and bombard them, Japan devised a secret plan to retaliate. The sightings of strange air balloons over the United States began in 1944. Some of their remnants were occasionally found and studied until one was captured and tied to a stake by a sheriff. The object appeared to be a paper balloon with attached bomb. 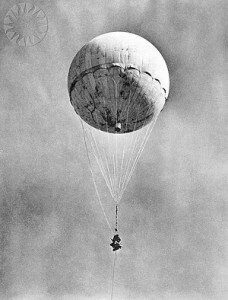 The US recognizance later found out that these balloons were being sent from over the ocean. Japanese launched a project on sending self-portable balloon bombs. The first weapon to strike between continents. Explosives were traveling from Japan to the US in jet streams, fitted with altitude meters through the course of development. The air flow cooled down the balloon and it descended into waters failing to reach destination. Later they were fitted with sandbags for weighs, released when the altimeter readings dropped, to get back into the air current. Providence of sand was the main clue about the source of attacks. This is how the search was geographically narrowed down to Japan as we know by now. Approximately 9 000 balloons were launched by Japan between 1944 and 1945. Only about 1 000 are believed to have reached their destination. Later their production ceased. Japanese were expecting to receive feedback about the success of their campaign. But within the entire year and much later the US were covering up anything connected with the occurrence. No mentions in the press, a complete silence. Soon after the bombardment of Japanese hydrogen plants the project was canceled. Probably, due to scarcity of resources and failure to see any results. In the end, no single Fu-go bomb, as it was called, managed to do any harm, except for one. On the 5th of May in 1995 a balloon was found by a group of citizens on a picnic. Local pastor, drove to a forest with his pregnant wife and 5 children from his church. Archie Mitchel wasn’t present when the rest had found the device. Thus becoming the only survivor of the tragedy which claimed his pregnant wife Elise and all five children. The oldest was 14. Archie Mitchel and the local telephone operator had to remain silent. However, soon the growing discontent of the local community forced the military to have a broad discussion about what happened. Taking part in WWII America was facing many tough choices. The country had to decide whether to use the nuclear weapons or continue trading blows with Japan. While Soviets were considering taking part to help the fellow communists, President Harry Truman made an urgent call. Two atomic bombs were dropped on Hiroshima and Nagasaki, forcing Japan to lay down arms. With American troops taking part in international proxy wars and the demise of Germany, Oregon bombing has become the only casualty of war to occur on US soil. Young, Elizabeth L. Fugo. Divertir Publishing LLC, December 20th 2011. McPhee, John. Balloons of War. The New Yorker: 52–60, January 29th 1996. Cook, Haruko Taya; Cook, Theodor F. Japan at War: An Oral History. New Press, Reprint edition, October 1993.